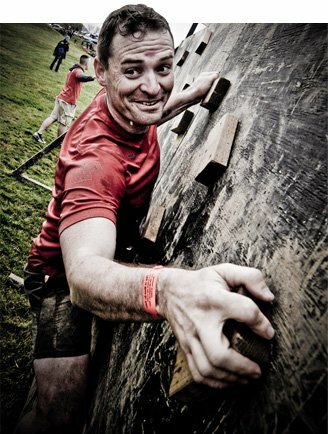 Signed up for an obstacle race but aren't sure how to train for it? These workouts will increase your endurance, strength and fit into whatever training regimen you're already doing. Successfully completing an obstacle race is as much about your strategy, cardiovascular fitness, and even your balance as it is about your strength. According to elite obstacle racer Junyong Pak, "Obstacle racing is such a functional sport. 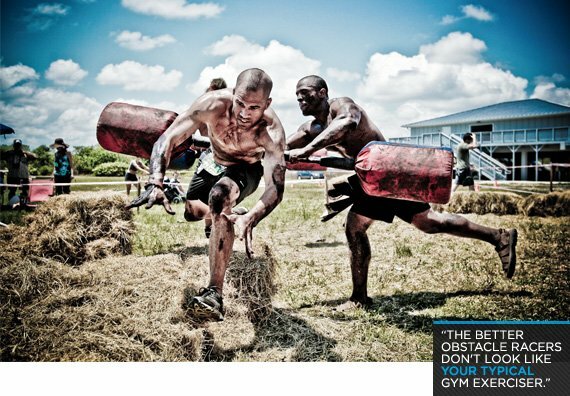 The better obstacle racers don't look like your typical gym exerciser." You don't have to scrap your entire training program to conquer the course, though. You can incorporate Obstacle Race Training (ORT) techniques into your current workout regimen without adding a lot of time or totally derailing it. Some of my tactics involve combining your weight training and your cardiovascular workouts so that they map more closely to the course; others are exercises and movements that you can add to your existing routine to tailor your strength and conditioning for the rigors of an obstacle course. These workouts target specific strengths and endurances you'll need to complete an obstacle race. They're also easy to fit into any fitness plan. Obstacle races feature a lot of barriers that require forearm and grip strength. Out on the course, you're often hanging from your hands, pulling yourself up and over walls, or carrying heavy loads (buckets of rocks, tires, logs, even your buddies). Monkey bars, rope climbs, wall climbs, and various haul and carry obstacles all require grip and forearm strength. Although each of these individual obstacles is relatively easy to complete individually, doing them one after another can really take its toll on your arms and hands. Factor in chilly or sweaty conditions, or mud- and grease-slicked surfaces, and you can see why so many people are unable to overcome obstacles that, on their own, seem like a piece of cake. The stronger your forearms and grip are, the more likely you'll be able to hang on until the finish. By far the best way to increase your forearms strength is by doing pull-ups and push-ups. Incorporate multiple reps of push-ups and pull-ups into your training regimen. If you can't complete pull-ups on your own or want to increase the number of reps you can do, do band-assisted pull-ups. Your goal should be to complete at least 50 pull-ups (or assisted pull-ups) 2-or-3 times per week. For grip strength, you really can't beat hanging on a rope. Get 5 feet of 1-inch-thick rope and hang it over a pull-up bar, branch, or goal post (you might need longer for a goal post). Hang onto the rope for as long as you can a couple of times per week. Also, just holding heavy dumbbells in each hand works great to improve grip strength. In obstacle races, you should expect to run through mud, water and sand along with completing 10-to-30 obstacles. That means your pace is going to be slower and strength will play a large role in your success. To train for this type of fitness, multiple Spartan race champion Hobie Call wears a weight vest when he trains. A weight vest provides functional skeletal and muscular resistance without altering your biomechanics. It also helps to increase your speed and endurance. Sure, you can also do heavy squats to build skeletal and muscular strength, but heavy squats don't convert to the type of endurance you'll need to do well. The following workout is designed to increase your endurance while focusing on raw strength. Your vest should be weighted enough for you to feel the resistance, but no so heavy that it slows you way down. This full body workout will be as intense as you make it. You'll need a rock, medicine ball or sand bag between 20-or-40 pounds. Use a weight that you can get over your head and throw at least 10 feet. If 40 pounds isn't difficult enough, add a weighted vest. Set your timer so it repeats a 2-minute countdown. Do this eight-minute cycle 3 to 5 times. Use the first round as a warm-up. This is a timed track workout that lasts between 30-and-90 minutes. If you're a conditioned athlete who can really push the intensity and are training for a 5k, limit the workout to 30 minutes. If you're training for an event that you expect to last 2 hours, plan on training for 90 minutes. For the shorter workouts, do the following exercises every 400 meters. If you're training for longer, do them every 800 meters. Do this workout at race intensity with no rest breaks. Strive for an even intensity throughout the workout. Once you get accustomed to the work, add a weight vest or increase the intensity. Gauge the intensity of your workouts by how well you recover. If you're not feeling recovered within a couple days, you're pushing yourself too hard. Keep checking back for more detailed ORT workouts! For more information on race-specific training, visit www.ConquerAnyCourse.com. Are You Ready For Game Day? Pre-Obstacle-Course Prep! Personal Trainer James Villepigue Gives You The Road Map To Your Ideal Physique! Fight The Indoor Blues: Energize Yourself With Outdoor Workouts!